Second Generation of SOEKS 01M (2014). One of the most popular dosimeters in the world, sales of this device in Japan exceeded 200,000 units, while global sales came near 500,b000 devices! The main advantage of the dosimeter Soeks 01m is the ease of use. The device measures the radioactive background and displays a warning message in case of excess. There’s no need to remember the radiation norms or deal with unfamiliar numbers. The device itself will warn you in case you deviate from the norm. 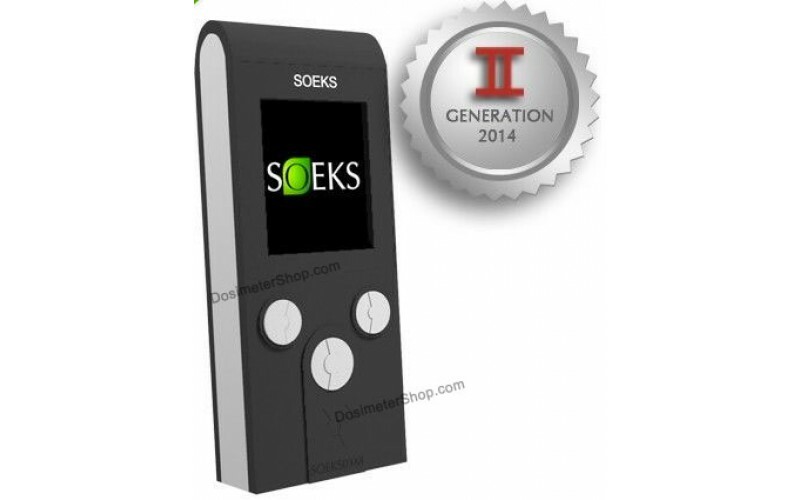 Soeks 01m is the fastest dosimeter on the market. The device instantly reacts to the presence of the radiation field by making a sound. Then it gives an accurate reading within 10 seconds after the measurement started, which is two - three times faster than the measurement speed of the nearest competitor. Due to its simplicity and high accuracy Soeks 01m gained popularity not only as a household device, but also as a professional one. It is used by the police in some European countries; it is also utilized by school children and students in conducting experiments and doing research work. Moreover, this device is used by many expert laboratories for professional purposes. Soeks 01 allows you to measure radiation in the air, water, food, household goods, construction materials, etc. Dosimeter Soeks 01m responds instantly to changes in the radioactive field by using sound signals. To obtain the numerical values of the level, it is required to measure radiation for 10 seconds. If necessary, you can use a comfortable scale in order to define the measurement intervals. As a comparison, if you buy any other household dosimeter you would need at least 30 seconds to do the same measurements. SBM 20-1: one of the most accurate and reliable counters. The history of this counter started after the Chernobyl accident. At that time compact and accurate counters SBM were designed in the USSR. Since then the counter was significantly modified. The latest version of the counter SBM-20-1 was designed in 2012 and it is installed in our devices. Reliability is an important quality of these counters. If you use low-quality counters it may eventually increase a significant error in the device. SBM counters stay accurate for 20 years or even more. Colorful, bright and informative TFT-display. When designing this device we have focused primarily on its usability even by non-professional users. Most dosimeters are made for professional use only and they are not very easy to use in daily life. They usually have black-white display, which outputs only the numerical value of the radiation. It is inconvenient because you have to remember the norms of radiation. Dosimeter Soeks 01m is equipped with a large and informative TFT display, which displays all the necessary information about the level of background radiation and its potential danger. Readings on the display are visible even in total darkness. It knows about radiation more than anyone else. Not many people would like to sort out complicated numbers and memorize radiation standards. Our device already knows all that stuff and it is ready to protect you from the harmful effects of radiations. All the rules are already put into the memory of the device. In case of excessing the normal level of radiation, the device will warn you with the message: "Dangerous background radiation." Nevertheless, it will also display the numerical value of background radiation. You can charge your device as a normal mobile phone. There are ordinary AAA batteries in the packaging, but you can buy an accumulator and charge the device by connecting it to the mini-USB. It is convenient and you can always come back to ordinary batteries at any time.